The interior of your vehicle is assaulted by every kind of contamination imaginable. From UV rays, to body oils, to spills, the interior faces many challenges and requires special attention during the detailing process. Since the interior of your vehicle is composed of many different materials, and it can be tempting to simply reach for an all-purpose cleaner and call it a day, but that�s not going to yield the best results. You need a specialized product like Pinnacle Vinyl & Rubber Cleaner & Conditioner to keep the interior looking and feeling like new. 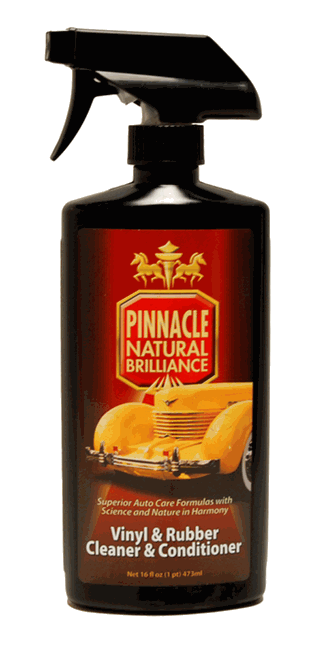 Pinnacle Vinyl & Rubber Cleaner & Conditioner utilizes advanced chemistry to create a formula that is safe for use on dashboards, door panels, vinyl seats, and other vinyl and rubber components inside your vehicle. Unlike lesser interior cleaners, Pinnacle Vinyl & Rubber Cleaner & Conditioner contains no petroleum distillates or silicone oils that will cause damage to delicate surfaces over time. In fact Pinnacle Vinyl & Rubber Cleaner & Conditioner is water-based, making it a safer alternative to high-octane cleaners. Simply spray Pinnacle Vinyl & Rubber Cleaner & Conditioner onto a microfiber towel and then wipe own the surface to create a clean, non-greasy finish that helps maintain the like-new looks of your vehicle�s interior! Use Pinnacle Vinyl & Rubber Cleaner & Conditioner once a month to keep the dash, vinyl seat, door panels, rubber seals, and other vinyl and plastic surface soft and pliable. Treated surfaces will be protected against UV damage and will maintain a low gloss sheen. Natural conditioning oils and a fresh scent will make Pinnacle Vinyl & Rubber Cleaner & Conditioner your preferred interior cleaner and protectant! Don't waste your money on watered down products that may or may not do the job. One application of this, cleans and conditions. Done! ProsAmazing result with just the 1st application. This is a pretty nice "all in one" product for interiors heavy in vinyl. It goes on streak free and leaves a nice, even, low gloss finish on vinyl interiors. It has pretty decent cleaning power too, especially if applied heavily or left to dwell. My car has a weird finish on the door handles/trim on the inside and this is the only product that I've used that isn't a complete pain to get to go on there streak free. Otherwise I'd be cleaning with something then very carefully dressing it. It's almost worth it for that part of my interior alone. ProsLow gloss, nice cleaning power, very pleasant scent and good "cling" ability. ConsIt's expensive compared to other interior products, so I wouldn't recommend it for businesses or anything - but for personal use it goes a long way.